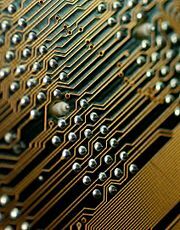 In electronics, printed circuit boards (PCBs) are used to mechanically support and electrically connect electronic components using conductive pathways, (or traces) etched from copper sheets and laminated onto a non-conductive substrate. Alternative names are printed wiring board (PWB) and etched wiring board. After populating the board with electronic components, a printed circuit assembly (PCA) is formed. PCBs are rugged, inexpensive, and can be highly reliable. They require much greater layout effort and higher initial cost than either wire-wrapped or point-to-point constructed circuits, but they are much cheaper, faster, and consistent in high-volume production. Today, PCBs are part of numerous devices that we use daily. With the development of more sophisticated and smaller components, we can see more and more integration using PCBs. One prime example would be modern computers. Many computer manufacturers are using PCBs as motherboards. This cuts down on the cost and simplifies the computer. Earlier, you would need to have three or four additional expansion cards to operate your computer. It was quite common to have a separate video card, sound card, modem, and sometimes game port. Nowadays, with the use of PCBs, they can all be integrated on a single motherboard. The only drawback is that if one component malfunctioned, the entire motherboard would need to be replaced. Many computer enthusiasts prefer to avoid an all-in-one motherboard, for the simple reason that they prefer to choose their own accessories, whether it's a sound card or video card. In the future, as technology improves, we will probably see PCBs of much higher quality and lower prices. The inventor of the printed circuit was the Austrian engineer Paul Eisler (1907–1995), who made one in England around 1936, as part of a radio set. Around 1943 the United States began to use the technology on a large scale to make rugged radios for use in World War II. After the war, in 1948, the U.S. government released the invention for commercial use. Printed circuits did not become commonplace in consumer electronics until the mid-1950s, after the Auto-Sembly process was developed by the U.S. Army. Before printed circuits (and for a while after their invention), point-to-point construction was used. For prototypes, or small production runs, wire wrap can be more efficient. Point-to-point construction uses terminal strips (also called 'tag boards'). A terminal strip is a stamped strip of tin-plated loops of copper. It is mounted in a way that electrically insulates it. Wire wrap uses a special tool called a "wire wrap tool" that has two holes. The wire and a quarter inch (6.35 millimeters) of insulated wire are placed in a hole near the edge of the tool. The hole in the center of the tool is placed over the post and is rapidly twisted. Originally, every electronic component had wire leads, and the PCB had holes drilled for each wire of each component. The components' leads were then passed through the holes and soldered to the PCB trace. This method of assembly is called through-hole construction. In 1949 Moe Abramson and Stanilus F. Danko of the United States Army Signal Corps developed the Auto-Sembly process in which component leads were inserted into a copper foil interconnection pattern and dip soldered. With the development of board lamination and etching techniques, this concept evolved into the standard printed circuit board fabrication process in use today. Soldering could be done automatically by passing the board over a ripple, or wave, of molten solder in a wave-soldering machine. However, the wires and holes are wasteful since drilling holes are expensive and the protruding wires are merely cut off. In recent years, the use of 'surface mount' parts have gained popularity as the demand for smaller electronics packaging and greater functionality has grown. Most PCBs are composed of between one and twenty-four conductive layers, separated and supported by layers of insulating material (substrates) laminated (glued with heat, pressure, and sometimes vacuum) together. Layers may be connected together through drilled holes called vias. Either the holes are electroplated or small rivets are inserted. High-density PCBs may have blind vias, which are visible only on one surface, or buried vias, which are visible on neither. The vast majority of printed circuit boards are made by adhering a layer of copper over the entire substrate, sometimes on both sides, (creating a "blank PCB") then removing unwanted copper after applying a temporary mask (e.g. by chemical etching), leaving only the desired copper traces. A few PCBs are made by adding traces to the bare substrate (or a substrate with a very thin layer of copper) usually by a complex process of multiple electroplating steps. Silk screen printing uses etch-resistant inks to protect the copper foil. Subsequent etching removes the unwanted copper. Alternatively, the ink may be conductive, printed on a blank (non-conductive) board. The latter technique is also used in the manufacture of hybrid circuits. Photoengraving uses a photomask and chemical etching to remove the copper foil from the substrate. The photomask is usually prepared with a photoplotter from data produced by a technician using CAM, or Computer-aided manufacturing software. Laser-printed transparencies are typically employed for phototools; however, direct laser imaging techniques are being employed to replace phototools for high-resolution requiements. PCB Milling uses a 2 or 3 axis mechanical milling system to mill away the copper foil from the substrate. A PCB milling machine (referred to as a 'PCB Prototyper') operates in a similar way to a plotter, receiving commands from the host software that control the position of the milling head in the x, y, and (if relevant) z axis. Data to drive the Prototyper is extracted from files generated in PCB design software and stored in HPGL or Gerber file format. "Additive" processes also exist. The most common is the "semi-additive process. In this version, the unpatterned board has a thin layer of copper already on it. A reverse mask is then applied (unlike a subtractive process mask, this mask exposes those parts of the substrate that will eventually become the traces). Additional copper is then plated onto the board in the unmasked areas; copper may be plated to any desired weight. Tin-lead or other surface platings are then applied. The mask is stripped away and a brief etching step removes the now-exposed original copper laminate from the board, isolating the individual traces. The additive process is commonly used for multi-layer boards as it facilitates the plating-through of the holes (vias) in the circuit board. Holes, or vias, through a PCB are typically drilled with tiny drill bits made of solid tungsten carbide. The drilling is performed by automated drilling machines with placement controlled by a drill tape or drill file. These computer-generated files are also called numerically controlled drill (NCD) files or "Excellon files". The drill file describes the location and size of each drilled hole. It is also possible with controlled-depth drilling, laser drilling, or by pre-drilling the individual sheets of the PCB before lamination, to produce holes that connect only some of the copper layers, rather than passing through the entire board. These holes are called blind vias when they connect an internal copper layer to an outer layer, or buried vias when they connect two or more internal copper layers. The walls of the holes, for boards with two or more layers, are plated with copper to form plated-through holes that electrically connect the conducting layers of the PCB. For multilayer boards, those with four layers or more, drilling typically produces a smear comprised of the bonding agent in the laminate system. Before the holes can be plated through, this smear must be removed by a chemical de-smear process, or by plasma-etch. The pads and lands to which components will be mounted are typically plated, because bare copper oxidizes quickly, and therefore is not readily solderable. Traditionally, any exposed copper was plated with solder. This solder was a tin-lead alloy, however new solder compounds are now used to achieve compliance with the RoHS directive in the European Union, which restricts the use of lead. Other platings used are OSP (organic surface protectant), immersion silver, electroless nickel with immersion gold coating (ENIG), and direct gold. Edge connectors, placed along one edge of some boards, are often gold plated. Areas that should not be soldered to, may be covered with a polymer solder resist (solder mask') coating. The solder resist prevents solder from bridging between conductors and thereby creating short circuits. Solder resist also provides some protection from the environment. Unpopulated boards may be subjected to a bare-board test where each circuit connection (as defined in a netlist) is verified as correct on the finished board. For high-volume production, a Bed of nails tester or fixture is used to make contact with copper lands or holes on one or both sides of the board to facilitate testing. A computer will instruct the electrical test unit to send a small amount of current through each contact point on the bed-of-nails as required, and verify that such current can be seen on the other appropriate contact points. For small- or medium-volume boards, flying-probe testers use moving test heads to make contact with the copper lands or holes to verify the electrical connectivity of the board under test. After the PCB is completed, electronic components must be attached to form a functional printed circuit assembly, or PCA. In through-hole construction, component leads may be inserted in holes and electrically and mechanically fixed to the board with a molten metal solder, while in surface-mount construction, the components are simply soldered to pads or lands on the outer surfaces of the PCB. Often, through-hole and surface-mount construction must be combined in a single PCA because some required components are available only in surface-mount packages, while others are available only in through-hole packages. Again, JEDEC guidelines for PCB component placement, soldering, and inspection are commonly used to maintain quality control in this stage of PCB manufacturing. After the board is populated, the interconnection between the traces and the ICs may be tested by boundary scan techniques. In boundary scan testing, test circuits integrated into various ICs on the board form temporary connections between the PCB traces to test that the ICs are mounted correctly. Boundary scan testing requires that all the ICs to be tested use a standard test configuration procedure, the most common one being the Joint Test Action Group (JTAG) standard. PCBs intended for extreme environments often have a conformal coat, which is applied by dipping or spraying after the components have been soldered. The coat prevents corrosion and leakage currents or shorting due to condensation. The earliest conformal coats were wax. Modern conformal coats are usually dips of dilute solutions of silicone rubber, polyurethane, acrylic, or epoxy. Some are engineering plastics sputtered onto the PCB in a vacuum chamber. Mass-production PCBs have small pads for automated test equipment to make temporary connections. Sometimes the pads must be isolated with resistors. Cordwood construction can give large space-saving advantages and was often used with wire-ended components in applications where space was at a premium (such as missile guidance and telemetry systems). In 'cordwood' construction, two leaded components are mounted axially between two parallel planes. Instead of soldering the components, they were connected to other components by thin nickel tapes welded at right angles onto the component leads. To avoid shorting together of different interconnection layers, thin insulating cards were placed between them. Perforations or holes in the cards would allow component leads to project through to the next interconnection layer. One disadvantage of this system was that special nickel leaded components had to be used to allow the interconnecting welds to be made. Some versions of cordwood construction used single sided PCBs as the interconnection method (as pictured). This meant that normal leaded components could be used. Before the advent of integrated circuits, this method allowed the highest possible component packing density; because of this, it was used by a number of computer vendors including Control Data Corporation. The cordwood method of construction now appears to have fallen into disuse, probably because high packing densities can be more easily achieved using surface-mount techniques and integrated circuits. Multiwire is a patented technique of interconnection that uses machine-routed insulated wires embedded in a non-conducting matrix. It was used during the 1980s and 1990s (Augat Inc., U.S. Patent 4,648,180). Surface-mount technology was developed in the 1960s, gained momentum in Japan in the 1980s and became widely used globally by the mid 1990s. Components were mechanically redesigned to have small metal tabs or end caps that could be directly soldered to the surface of the PCB. Components became much smaller and component placement on both sides of the board became far more common with surface mounting than through-hole mounting, allowing much higher circuit densities. Surface mounting lends itself well to a high degree of automation, reducing labor cost and greatly increasing production rates. SMDs can be one-quarter to one-tenth the size and weight, and one-half to one-quarter the cost of through-hole parts. History of "Printed circuit board"
This page was last modified on 2 June 2015, at 15:04.